Jordan Brand will be bannered by their new models for 2012, but that doesn’t mean that retros won’t get attention like the upcoming edition of the Air Jordan 1 Phat. 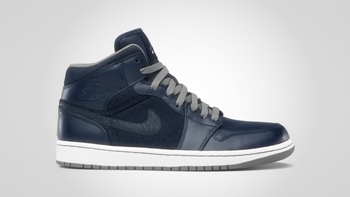 The Air Jordan 1 Phat, which gained sufficient attention when it was released in various colourways last year, will be coming out in Obsidian/Cool Grey-White, which features all-navy leather and canvas based upper part that sits on a white midsole and cool grey outsole! Grab one and you will surely get your money’s worth!